On Sunday, March 10, the Yavneh Academy sixth grade girls, joined by mothers, grandmothers, aunts and teachers, celebrated their bat mitzvah year with the girls of the House of Hope, located in Netanya, Israel. As a grade, the Yavneh girls have been collecting simcha dresses to share with the Israeli girls. House of Hope, is a welcoming and warm home that saves dozens of girls each year from miserable childhoods due to horrible trauma and neglect and gives them tender loving care and hope. Sunday morning was all about the celebration. Thank you to Yavneh committee members Tova Burack, Shula Lofstock, Keren Fisher, Bonnie Beckoff and Barbara Smilow for their hard work. The sister-to-sister event was inspirational and showcased the talents of Yavneh’s young women and their sisters in Israel. 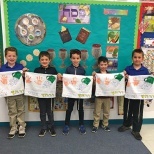 After making friendship bracelets, which will be sent to the students’ new friends in Israel, and assembling mishloach manot which were delivered to sister-to-sister in Passaic, brunch was served. Barbara Rubin introduced the event and Margo Weinberger shared her personal experiences at the home. Margo’s bat mitzvah project was “walking” for the girls. To date, she has raised more than $5,000 for the home. 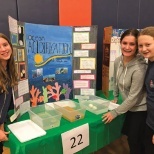 Hearing of her bat mitzvah party with the girls was insightful and allowed a real awareness of what the Yavneh—Bayit V’Tikvah partnership means to everyone. As Yavneh Skyped with Israel, the girls of Bayit v’Tikvah sang and danced and the Yavneh students sang and danced as well. 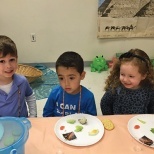 Morah Jordana Baruchov delivered words of Torah connecting Megillat Esther and the hidden quality that can be found in each girl. The morning ended with dessert, spontaneous dancing, and distribution of bat mitzvah gifts, organized by YPAA and Dr. Aliza Frohlich and bentching. For more information on the organization and how to make a donation, please visit their site, www.bayitvtikvah.org.